I have never met anybody who wasn't against war. Even Hitler and Mussolini were, according to themselves. 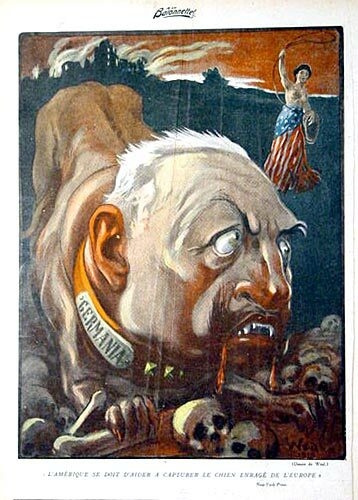 The Illustrated Enemy looks at graphic depictions of national leaders and military and civilian life, as illustrated by artists both before and during World War I. [A new section dealing with World War II Soviet posters was added in April, 2007]. These images were originally published in magazines, books, posters and postcards. The artists are French, German, Italian, Dutch, Russian, Spanish, British and American. Many are unabashedly patriotic, even jingoistic; others are just as firmly anti-war. Links to related sites are provided, and since this site is a work in progress, planned additions and the inevitable corrections are scheduled for the not too distant future. Links at the top of any page will let you navigate within the site. Arrows within any section of the site will take you to the next page, or back to a previous page. European countries have been redrawn as reflections of political stereotypes and realities -- one mid-19th century view and a second from 1914. A weekly journal of satiric illustrations focussed on the Great War (WWI) and published in France (1915-1918) -- each issue was devoted to a specific topic: national security in France; disparaging German culture through views of German women (collectively termed 'Gretchen'), fashions, or science, and of course, caricatures of the Prussian Kaiser, Wilhelm II, his son the Crown Prince, and their ally, the Austro-Hungarian Emperor, Franz Joseph. One special issue was devoted to the work of the Dutch artist, Louis Raemaekers. The majority of the cards here show the 'other' side, the 'enemy' side, as something evil, brutish, and/or cowardly; those that deal with 'our' side have strong, healthy, even happy people, going about the business of war. A few cards address the human costs in terms of refugees, orphans,and prisoners, after the battles and the peace treaties have been concluded. Boardman Robinson, Stuart Davis, Robert Minor and Art Young whose work appeared in The Masses, a 'radical' journal, so-called for its advocacy of social justice, and A. Paul Weber, a German artist, who lived to decry two world wars . John Reed, who traveled with Boardman Robinson, reporting on the wars in Europe, also wrote articles for The Masses and other progressive magazines. He is best known for his reporting on the Russian Revolution in the book Ten Days that Shook the World. His essay, This Unpopular War appeared in Seven Arts in 1917, as America was exchanging neutrality for conflict in Europe. See also Images of American Radicalism: cover illustrations from The Masses 1913-1917, a site from which some of these images have been borrowed. For the complete Masses, as well as a treasury of other journals, consult The Modernist Journals Project, a joint project of Brown University and The University of Tulsa. World War I:Trenches on the Web: a history of The Great War. For comparison, Powers of Persuasion: Poster Art from World War II, part of the National Archives Exhibition site (which also includes New Deal for the Arts, a sampling of Depression Era images from between the two wars). Windows on the War: Soviet TASS Posters at Home and Abroad 1941-1945, edited by Peter Kort Zegers and Douglas Druick, in conjunction with the exhibition at The Art Institute of Chicago, 2011 and Yale University Press. See also Graphic Witness related links, especially for Propaganda Remix Project.